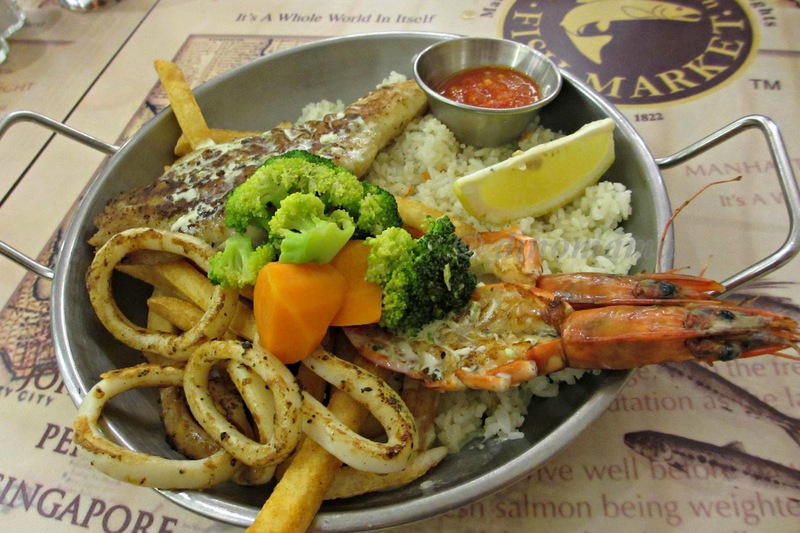 Many years ago in 2002, I had a great dinner with a girlfriend at The Manhattan Fish Market, Plaza Singapura branch. I told DinoPapa that the ocean catches are fresh, the food is delicious and we should go there one day. A decade later, the "one day" finally materialized. I was excited as it will be the 2nd time I dine in the restaurant, I was looking forward to tasting the dishes again, this time with DinoPapa, plus this is our couple date after so long. 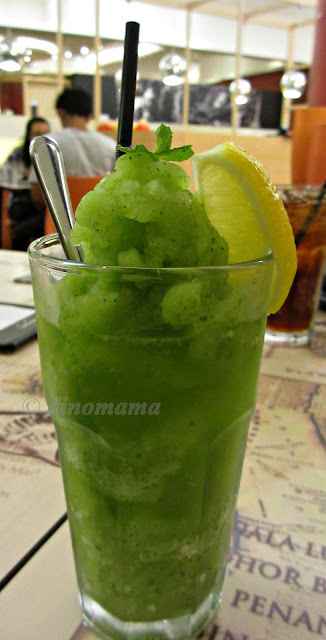 I decided to try something different and ordered the blended citrus mint while DinoPapa order the usual coca cola. 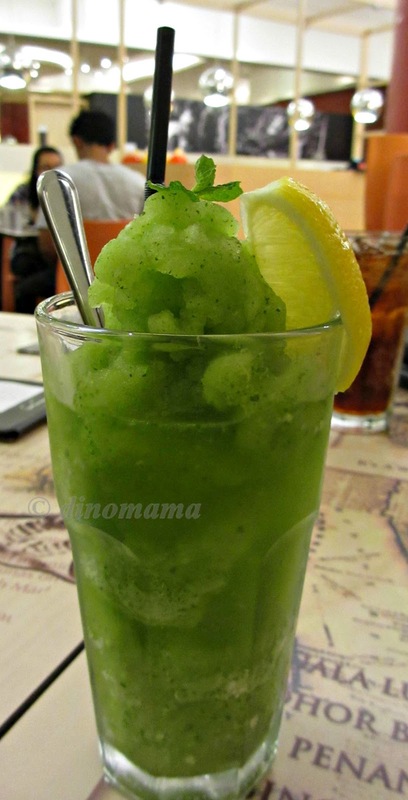 My drink is very refreshing, thirst quenching mint & a hint of lemon. Back to the restaurant for the 2nd time in a span of a decade makes me want to eat EVERYTHING, so I ordered their small grill, not very small as you can see the portion is quite generous. Everything is delicious except the garlic rice, its a bit too dry and I can only taste a little bit of garlic, which is good since not every one is a fan of garlic. And perhaps they could give us bigger prawns? 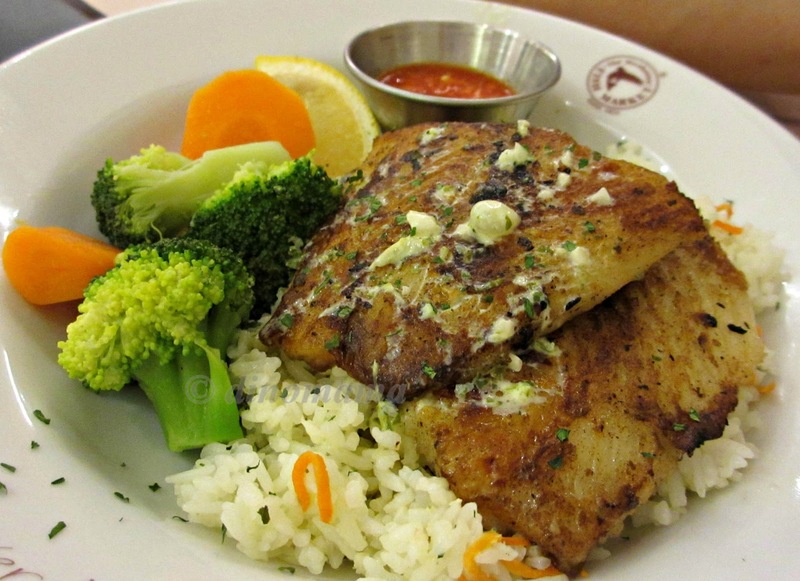 DinoPapa's Mediterranean baked fish (we think, the visit was couple of months ago, can't remember). "Dry" in his words, there are no sauce to accompany the food, not impressive especially with the same dry garlic rice, even the boiled vegetables seems dry to the mouth. Well, so far I have not given thumbs up for the food. Now I am going to share my unpleasant dealings with the staffs, which did not affect my review on the food in any way, that's why I write this AFTER the food. When we arrived at the restaurant at slightly pass 6.20pm, only 3-4 tables were occupied. 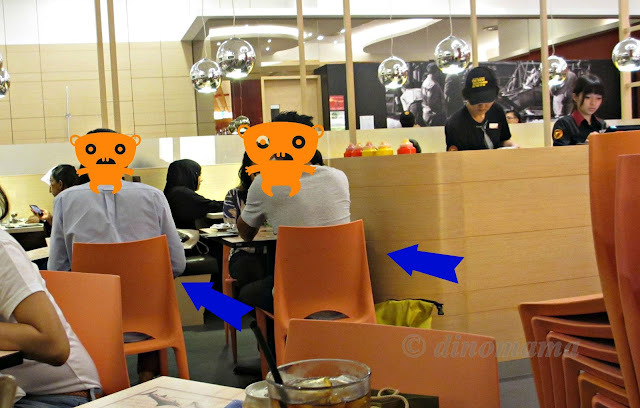 The waitress showed us to the tables (as in the photo below) but I declined these 2 tables because table #1 is right beside the food preparation counter and table #2 is in the meeting point of 2 walkways. As you can see, the bottles of sauces on the food preparation counter is quite near the customer's face. I observed the waiter for a while and she has to constantly grab them to prepare the sauces or whatever in lightning speed. Apart from the noise from the preparation which I do not fancy, what happened if she accidentally send the bottles tumbling onto our table or the sauces flying onto us? Table #2 is in the middle of traffic, the narrow walkways means chances of people walking and bumping onto your chair is HIGH. Not so cool being constantly into by someone's bum or bags while having your meal. Oh and when I declined these 2 tables the waitress gave me an unpleasant look almost immediately. She then pointed to a booth seat but casually mention that 1 side of the seat is faulty; means both of us have to sit side by side to eat our food and hope that the whole table will not tumble down on us before we are done. NO WAY! She said in her now-very-black-face that its either these 3 tables as "later on there will be many groups coming in and it will be crowded." I almost walk out of the restaurant when I spotted this 4 seater table at the corner, I gave my last shot and made up my mind that we will leave if she is unable to give us that empty table. Well, she "okay-ed" but not before giving us a disgusted look. So we sat down at this corner table with sticky table top, stacks of chairs behind DinoPapa, trying to make the best out of the unpleasant encounter with the waitress. We ordered our drinks and food, we would have been done and left the restaurant in half an hour, way before the crowd comes in (and the waitress is right, its full house by 7pm) but it took some time for our food to be served. Ok, some of you may ask why I am so persistent. Well, for the FOOD of course! No doubt the service is at such low standard but I thought its worth the "humiliation" as I can still remember how good the food was during my 1st and only visit some 10years ago. On top of that, seeing how crowded it is every time I pass by their branch at Plaza Singapura, I gathered that the food can't be that bad. And I was wrong. Sorry daddy for making you go through these nonsense and eating their food. Yes I agree, we can whip up the same dishes but tastier in every way. 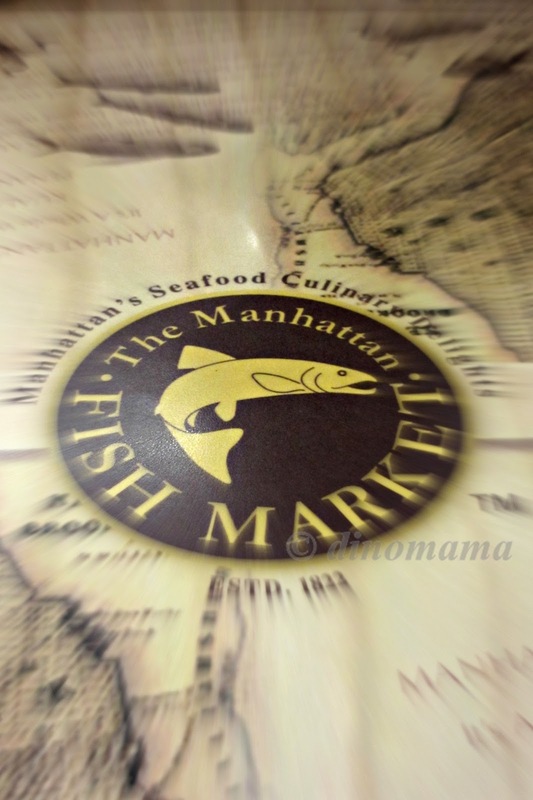 Sad to say but this restaurant is in our little black book of Banished Stuffs. Remarks : I am in no way affiliated to the management of The Manhattan Fish Market or have been compensated to write about this. All opinions are 100% based on our experience during our visit. 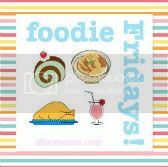 I am hosting a weekly Foodie Fridays linky, join me if you can, I'll be very happy to welcome you on board. Eh... the icons you placed on the customers very cute! Like playing shooting game! pew pew pew! :p I have not been to their restaurant for a long time liao. I think, standard has dropped. must hide their face lah coz not nice to show their face plus not talking about them. Hi Jen, I'm aghast at the waitress' attitude! Just because they are packed every weekend does not mean they can treat customers rudely. If I were you, I'll speak to the manager and walk out of the restaurant. Personally, I think their standards have dropped too...it's good that you share your experience with us so we can avoid it like a plague! Bad reviews are always interesting to read. People always enjoy drama stories... but really bad for the business. Their own fault anyway.